SOME of the world’s top railway artists have been brushing up on their unique talents in readiness for the annual exhibition organised by the Guild of Railway Artists that opens at Kidderminster Railway Museum on August 25. Railart 2018, which is being held at the museum for the 14th time, will feature more than 60 works of art using a variety of mediums. Brush strokes: GWR 4-6-0 No. 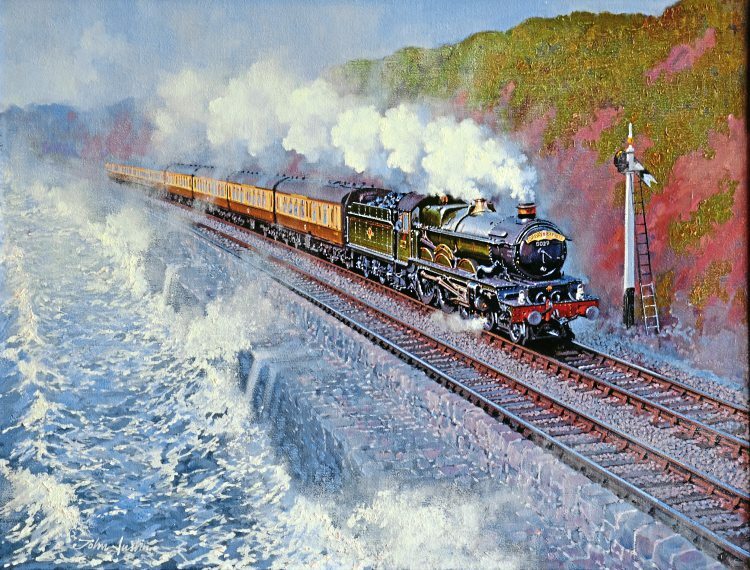 5029 Nunney Castle heads the Up ‘Torbay Express’ past an angry sea at Dawlish in a painting by Guild of Railway Artists’ president John Austin that will be exhibited at Railart 2018 at Kidderminster Railway Museum between August 25 and September 30. A selection of the paintings to be exhibited was due to be held a week before opening, and competition for places was stiff, according to guild spokesman Rob Pulham. Last year, paintings were priced from below £100 up to £5750, and nine were sold within hours of the exhibition opening.